In the dying light of a September evening in 2016, in a remote mountain cabin 45 miles from Hanover, they gathered for the last supper. Former Dartmouth Outing Club members, lodge crew, students, faculty, alumni—even parents with their children—came together for one last Thanksgiving-style feed and a chance to pay their respects. After years of study and passionate, sometimes tear-filled debate, the decision had been made to tear down the College’s aging Moosilauke Ravine Lodge and replace it with something new. Demolition would begin the following day. Inside the lodge, they squeezed onto benches at wooden tables that had been pushed together in long rows, crowding the great room. Small bouquets of end-of-season wildflowers—orange hawkweed, yellow-tipped Indian blankets—dotted the table settings. Green-aproned Dartmouth students filled the tables with heaping platters of turkey, bowls of gravy, steaming potatoes. From the tables and from windowsills and along the mantel of the old stone fireplace votive candles softly flickered. Rory Gawler ’05 read a poem he’d written for the occasion. He wrote of beams with the burnished sheen of a cherished instrument, a patina of timeless affection. 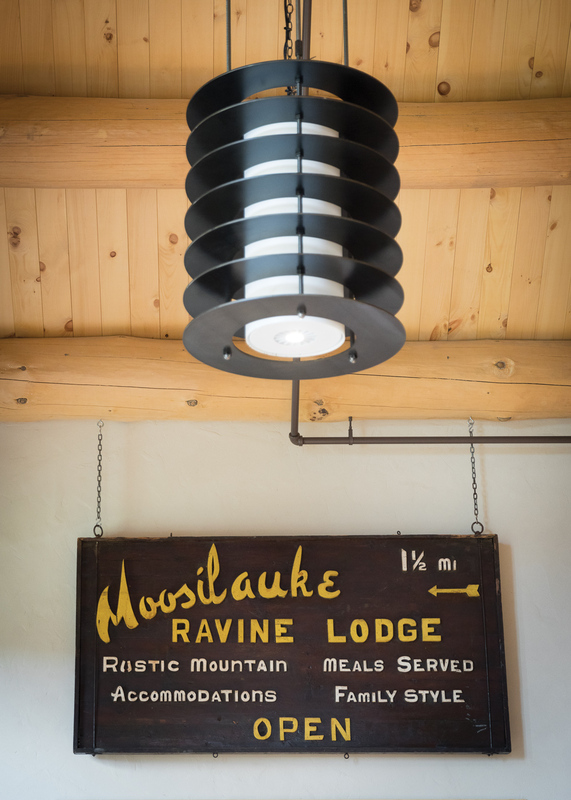 Energy-efficient lights illuminate a sign salvaged from the old lodge. Natural light seeps through an opening in the stone chimney. Afterward, as crew members cleared the tables and stacked them out on the side porches, caller David Millstone and muscle memory led the alums through the contras and squares and the “Salty Dog Rag.” The floor swayed underfoot. Later, as everybody sat around the old fireplace, Evan Skow ’03 leisurely recited a 40-minute version of the Doc Benton ghost story (many here had heard his virtuosic two-hour version), surrounded by all those mounted animal heads and moose antlers and wooden skis and framed black-and-white photos and old trail signs, all that campy decoration and burnished patina, all those memories and rituals that connected thousands of Dartmouth students across the decades. Anybody looking on could tell this wasn’t just a cabin in the woods or another College-owned building. It was more like a beloved retreat that had absorbed the imprint of generations of the Dartmouth family. Within a couple of days it would no longer exist. To those who knew the long history of the Ravine Lodge, that it still existed at all was a miracle. The log structure had been built as a ski lodge in the summer and fall of 1938, just as the trails on Mount Moosilauke were blazing Dartmouth’s position atop the new collegiate sport of downhill ski racing. The College’s legendary woodcraft advisor Ross McKenney led the construction, overseeing a crew of professional woodsmen from the nearby town of Warren. Architect R.D. Butterfield ’30 made the bold decision to forgo an easier, flatter building site just to the north, which would have sheltered the lodge and placed it looking down the valley. He set it instead on a steep and difficult perch, facing into the teeth of the prevailing north-northwest wind—but looking up at Moosilauke’s summit 2,200 feet above. With spruce logs cut from nearby Jobildunc Ravine, using axes and adzes, hand tools, two draft horses and no power equipment save a gas-powered cement mixer, McKenney’s crew built a crude but dramatic 6,600-square-foot log cabin. Their centerpiece was a great room with a perfectly scaled stone fireplace and chimney off to the side so that its windows were the focal point by day. Moosilauke’s presence was felt throughout the building, and the lodge transformed Dartmouth’s relationship to the mountain. The great room features a massive fireplace under an 11-foot-long granite lintel. With tables that fold and roll, lodge crew will find it much easier to convert the space into a dance floor. World War II came, and all that momentum stalled. Use of the Ravine Camp (as it was called until 1949) dwindled. The camp struggled financially after the war as New England’s emerging chairlift-driven ski industry enticed skiers to more accessible areas. The College folded its winter operations on Moosilauke in 1953. A decade later it offered to lease the Ravine Lodge to the Appalachian Mountain Club for a dollar a year. Through the 1960s, the lodge sat derelict and mostly abandoned—except for freshman trips in the fall and for the occasional hippies and summer campers who moved in and used the building as if it belonged to them. It was only in the 1970s, after Dartmouth adopted its year-round calendar, and with interest in the outdoors spiking, that the Ravine Lodge came into its second life as the spiritual center of Dartmouth’s outdoor culture. Freshman trips, which had begun in 1935 with optional participation, became institutionalized. Suddenly, 70 percent of the incoming classes took part in the fall ritual (the percentage would eventually rise into the mid-90s), getting their introduction to Dartmouth and each other, not on a manicured campus but through songs and stories and shared meals in a log lodge 2,500 feet up the eastern flank of Mount Moosilauke. Use of the Ravine Lodge expanded dramatically beyond the fall. From May through October students in the DOC managed the lodge and offered rustic accommodations and hearty family-style meals for the Dartmouth community and the general public. The burgeoning use required extensive repairs and a dramatic upgrade in water and septic systems. The College invested in a maintenance schedule. A Moosilauke advisory committee was formed, made up of students, faculty, alumni and administrators. For the first time Dartmouth began regularly monitoring the condition and safety of the building. 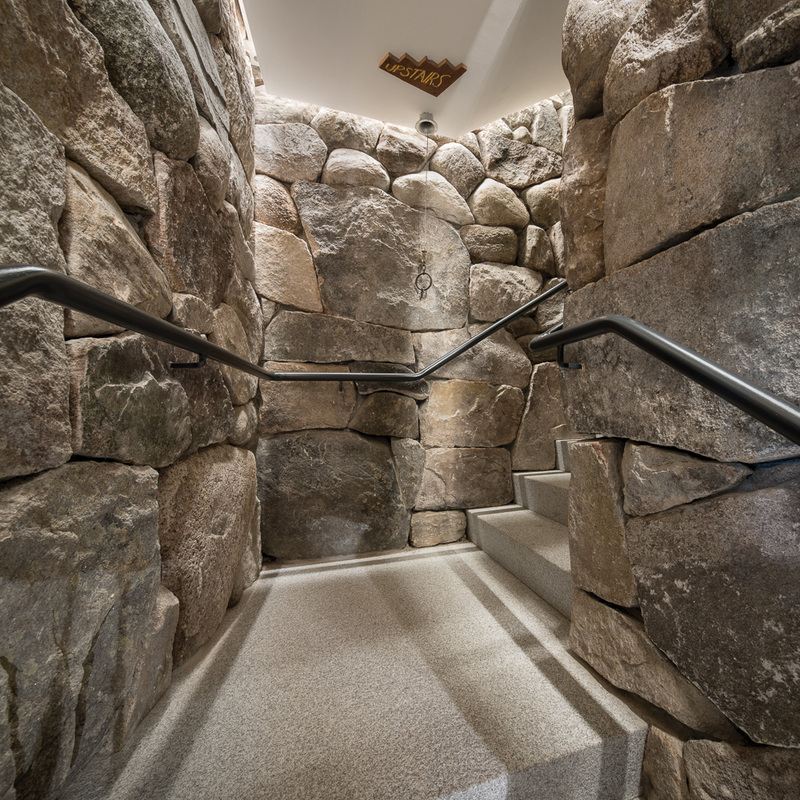 A hidden interior stone staircase winds up and through the 20-by-20-foot stone chimney structure. 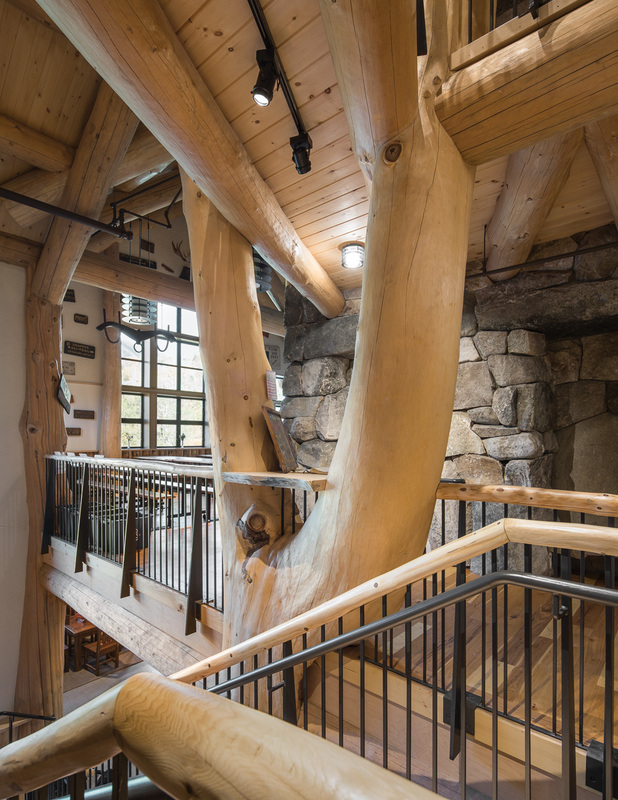 The giant branching white pine dubbed “Slingshot” by timber framers rises from a 22-ton granite boulder through the first-floor framing. No one had ever pinned an official number on the Ravine Lodge’s life expectancy, but McKenney, and later, ski coach Al Merrill and DOC director Earl Jette, the two people at Dartmouth who pushed hardest to resurrect the old place, figured that 50 years of hard use in that unforgiving setting was the upper end of what anyone could reasonably hope for. The crudely built lodge passed that mark in 1988. By the time the College commissioned a comprehensive engineering study in 2014, the rot and longitudinal cracking in the spruce logs had been progressing for decades. The lodge’s corner posts had become so weakened that they were in danger of no longer supporting the loading of the roof. The accumulating freeze-thaw damage to the foundation had reached a tipping point. The constant need for repair had been growing costlier by the year. Lodge crews were losing ground to antiquated electrical and water systems. There were accessibility issues, building code issues, capacity issues. And yet the number of people who wanted to eat and sleep in the shadow of Moosilauke kept growing. Renovating the lodge wasn’t out of the question. Indeed, strong voices inside and outside the campus community argued for just that. Former lodge crew member Craig Sakowitz ’93 spearheaded a 2015 #SaveMoosilauke campaign and launched a petition to preserve the old structure, as the Dartmouth Outing Club of Northern California had recently done with its 70-year-old cabin in Donner Pass. Alumni wrote impassioned letters to the trustees. But the options for renovation explored by Maclay Architects of Waitsfield, Vermont, turned out to be unworkable and exorbitantly expensive. In any case, bringing the existing lodge up to code would fundamentally change much of what people loved about the old building in the first place. David Hooke ’84, a professional timber framer and member of the Moosilauke advisory committee, says it took him a long time to accept that the Ravine Lodge had to be torn down. The engineering study was unequivocal. The advisory committee ultimately endorsed the firm’s recommendation to rebuild rather than renovate. The discussion shifted to how any new building could possibly replicate the warmth and quirkiness and rustic charm that had become an integral part of the lodge’s character. Putnam “Put” Blodgett ’53, chair of the advisory committee, made a plea for building a grand, traditional, full-log cabin. On the outing club’s email listserv, he lobbied for Dartmouth students to have the once-in-a-lifetime opportunity to help create the largest log structure in New Hampshire. It would be, he wrote, a monument to the College’s spirit and its North Country heritage. The listserv lit up with support, including a positive and detailed feasibility analysis from engineer Chris Polashenski ’07, who as a student had spearheaded the impressive full-log replacement of the DOC’s Harris Cabin in Etna, New Hampshire. A second-floor walkway traverses Slingshot. 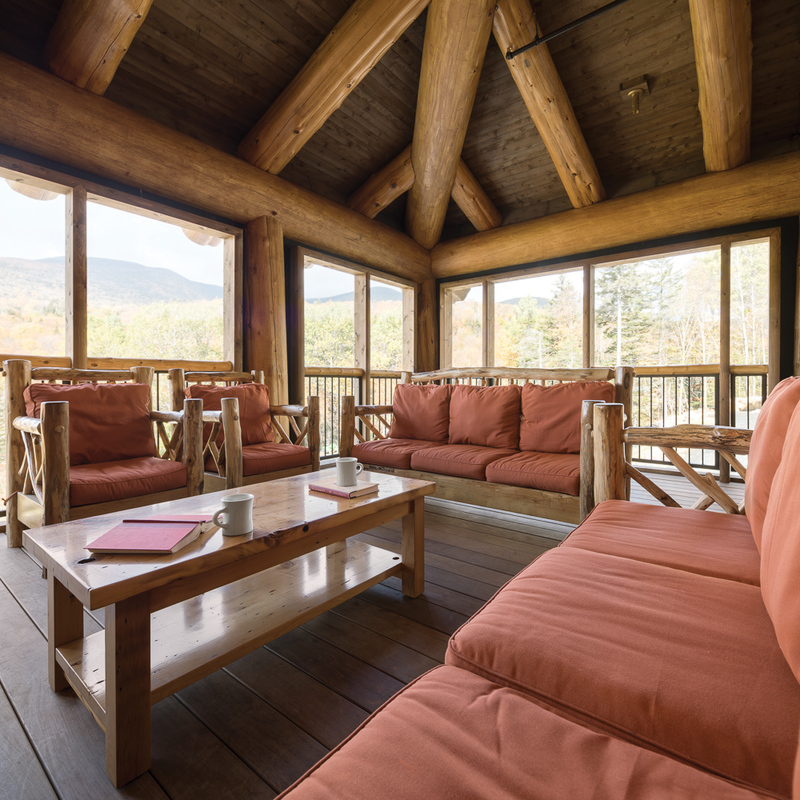 A screened porch offers respite in the lodge’s northwest corner. charm, but also from former lodge crew members who loved (continued on page 104) the sound of a banging screen door and the lessons they learned from fixing broken panes of glass. They heard from timber-frame proponents who talked in terms of design flexibility and insulation R-values (a measure of thermal resistance). 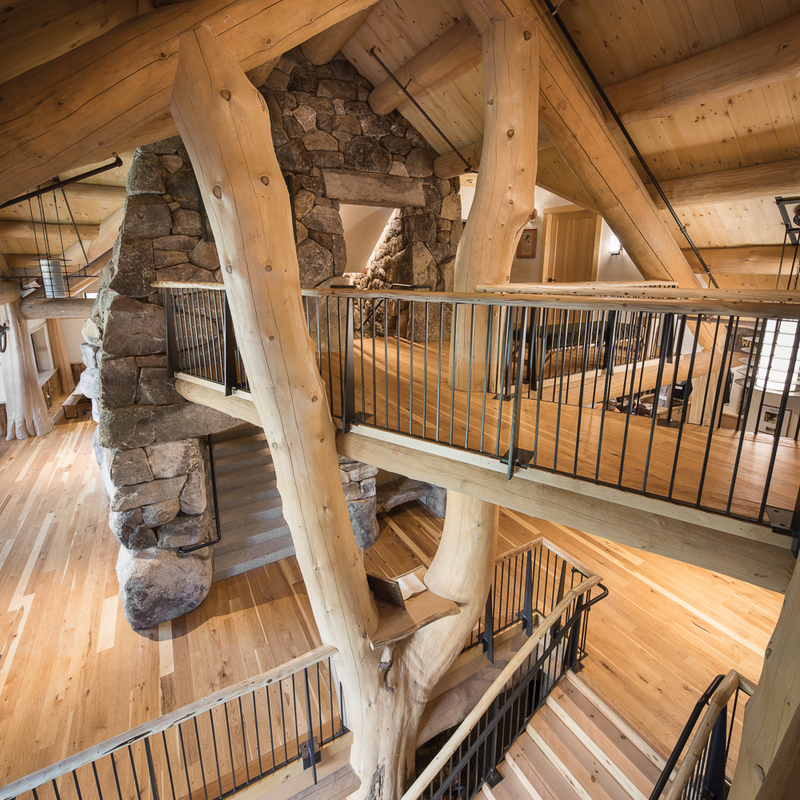 They heard from timber-frame critics who argued that drywall and plaster were antithetical in a mountain lodge and that sawn posts and beams, even with expert joinery, even on a large scale such as the Dartmouth Skiway’s McLane Family Lodge—seemed sterile and lifeless compared to the living, breathing log cathedral McKenney had built. 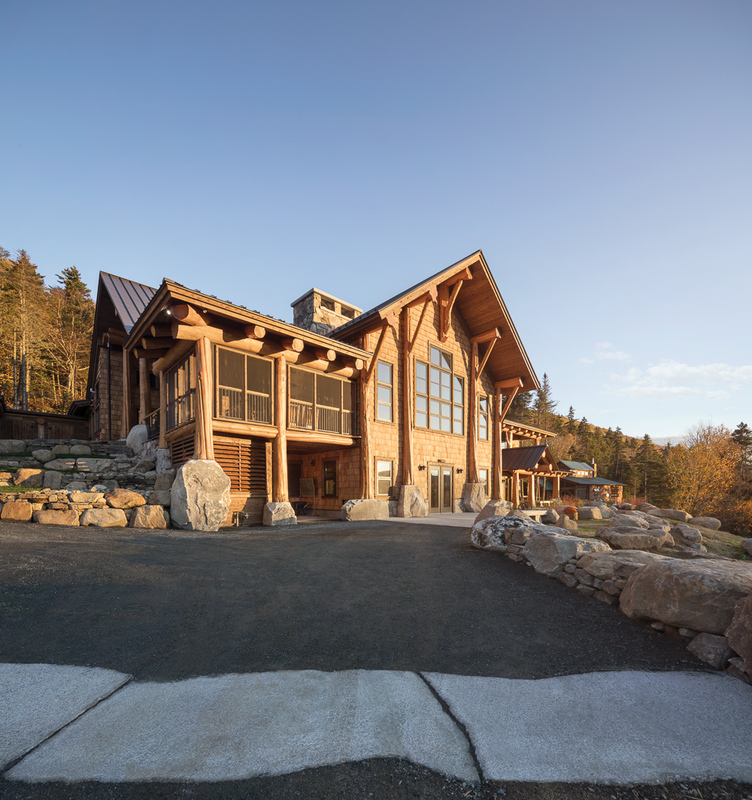 Whatever its construction and features, the new Moosilauke Ravine Lodge would have an elevator, a wet sprinkler system, handrails, wi-fi and a fresh-air-exchange ventilation system. To many of those who loved the old lodge, the question was: Would it have a soul? For the architects contemplating how to satisfy so many technical requirements and so many stakeholders with heartfelt stakes in the new building, that bright starting line might as well have been the edge of a razor. The production schedule would be aggressive, some said crazy: teardown in early September 2016, with a new lodge completed in time for first-year trips by the end of the following summer. Maclay had carved out a reputation for designing super-efficient buildings. The firm turned to John Nininger of the Wooden House Co. of Wells River, Vermont, for ideas. Nininger was unusual in the trade, even among master craftsmen. A member of both the timber-framers and log-builders guilds, Nininger cared deeply about tradition and energy efficiency. In addition to the traditional skills of square-rule, mortise-and-tenon joinery, dovetailed corners and hand-hewn timbers, Nininger had refined a suite of creative talents that incorporated full-scribe joinery, log gables, sanded log ends, hidden screw jacks, log archways, naturally curved timbers and a unique method of round notching for full-log construction. His log buildings were extraordinarily tight. 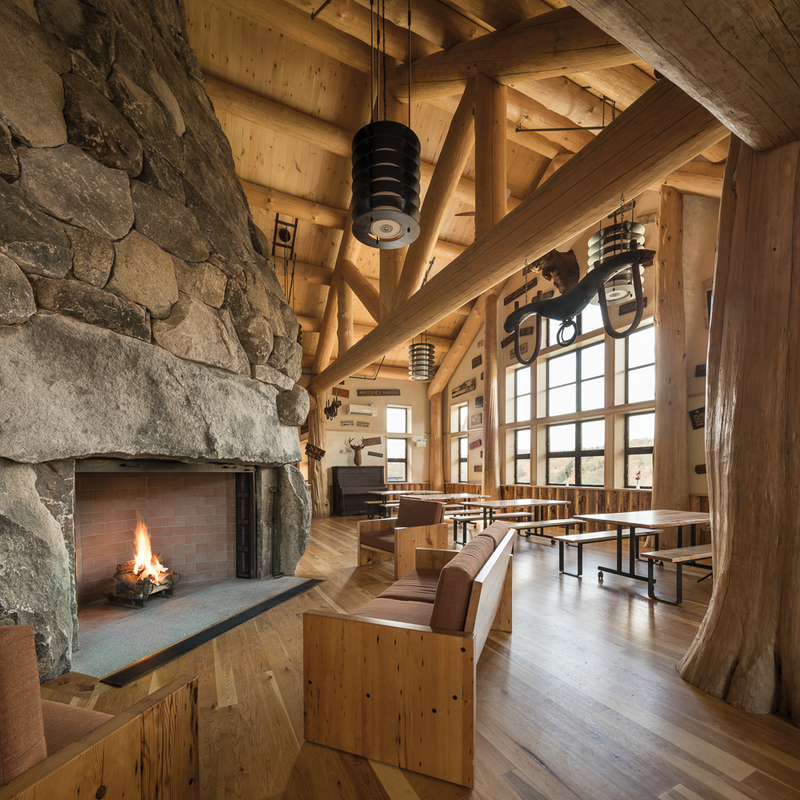 Nininger came up with an ambitious compromise that promised to capture the rustic warmth of logs and the literal warmth of a super-efficient envelope: a heavily insulated, mortise-and-tenon timber frame, but one joining together huge full-round logs with tons of exposed wood surfaces inside. As much as possible, he’d use the natural contours and variations in the posts and beams to create the rustic character of a true log building. In concept, it sounded stunning. Maclay and Dartmouth went for the plan. The following June, as Blodgett was waiting for a trailer load of his pine to be emptied at Nininger’s field, he wandered to the back of the truck and counted the tree rings in the log butts. They averaged 101 years old. Some of the logs, 60 feet long, would have to be cut because they were longer than any of the logs specified in the plan. “It broke my heart,” Blodgett says. Nininger had also located a rare stand of eastern white cedar just north of Wells River. Those cedars—extraordinarily large, with impressive root flares—tapered too fast to be used as long carrying members, but were exquisitely suited for the vertical posts in Nininger’s plan. During the end of a warm February in 2016, when the ground was frozen, Nininger’s crew pulled a hundred of them out of the wetland. As the log stockpile grew in Wells River, interestingly shaped and curving logs were set aside and imagined into the frame. The crew lived with the wood, studied it, spent, on occasion, more than a day positioning and subtly turning and measuring and repositioning and remeasuring a single branching or complex log, running lasers to get a true center line and ensure the cuts would deliver the engineering. The massive Y-shaped pine designated “F-9” on the framing grid was affectionately referred to as “Slingshot.” “Three-Tooth” was the name they gave the log that branched out with upright arms, like a saguaro cactus. It would make a perfect, if technically difficult, corner post. A smaller log with an inosculation—where a branch had bent back and re-embedded itself—was first dubbed “Cyclops” for its resemblance to a giant single eye, and then “Odysseus,” for the way that sounded. It would be integrated into the pediment on the lodge’s southwest, mountain-facing entrance. The setting sun highlights architectural details such as cedar shingles, a standing-seam metal roof and the fieldstone chimney. Nininger’s crew—and Hooke’s crew, for parts of the job—put in 60-hour weeks during eight months preparing and building the frame—some 20,000 hours in all. They marked, cut and assembled the entire frame upside-down, before disassembling it and trucking the finished logs to Moosilauke as winter closed in on the mountain. Some of the assemblies in the roof structure alone weighed five tons. All winter and through a protracted mud season, while extreme weather dumped more rain and snow on the mountain than any year in recent memory, the ravine filled with the sound of wind, diesel engines, pneumatic drills, back-up beepers. Simply keeping the access road open for the construction vehicles was a challenge. Workers—some commuting more than two hours each way—arrived in the dark and left in the dark. They poured the new foundation under the same difficult conditions McKenney had faced. They erected an interior steel skeleton and raised and sheathed Nininger’s wild and natural frame. The building was weathertight, eastern white cedar shingles were going up on the exterior walls, and sub-contractors were jockeying for space around mechanical, electrical, plumbing and fire-protection systems. But the schedule, in large part because of tough weather, had slipped more than a month. The College announced that the new building wouldn’t be ready for the first-year trips after all. The trips, this year, would converge at the Skiway’s McLane Family Lodge. In the summer the job turned to finish work. The best of the logs from the old lodge had been set aside and trucked to a portable sawmill, where they were sawn into half-rounds and one-and-a-quarter-inch slabs with live edges that now colored interior walls and wainscoting. Other logs had been sliced into sections, the disks turned into thank-you mementos for contributors to the project. Two original transom lights found new use as interior windows. One of the wagon-wheel light fixtures went back up on the ceiling. A craftsman in Springfield, Vermont, was building the lodge’s new furniture from sustainably harvested wood from the College Grant and salvaged material from old New England plank houses. The old wooden screen door, obsolete in the new, energy-efficient airlock entrance, was fitted for banging on a side porch. The old trail signs and wooden skis and campy memorabilia sat in storage in Taylor’s Class of ’74 Bunkhouse. The new lodge crews would add them back in their own fashion starting in the fall. 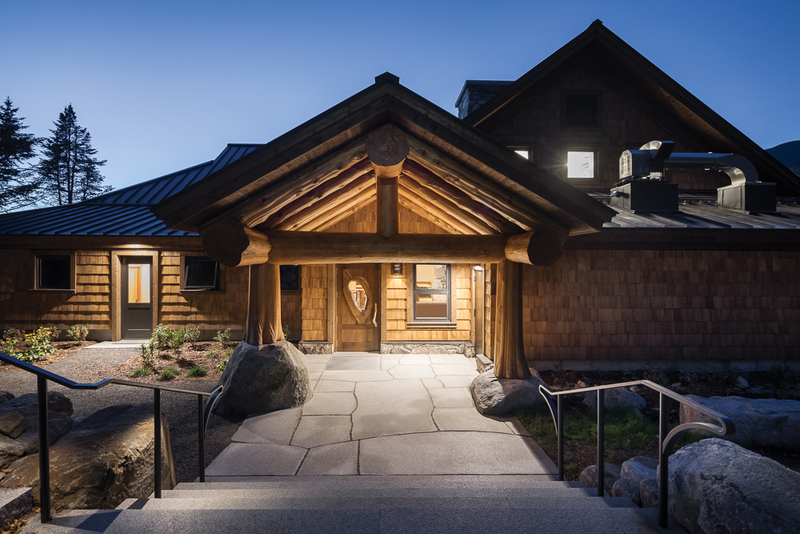 A heavy-timbered portico shelters the lodge’s main entrance, which features a new door with an eye-shaped window that incorporates a section of an inosculated tree branch. Pike struggles to compare the cost to conventional projects, because, as he points out, there was nothing conventional about this facility. In the terms of the trade and across higher education, there were simply no comparables. The cost reflected a commitment to local materials and craftsmen and to energy efficiency. It reflected a commitment to a 100-year timeline, including a 12,000-head sprinkler system, three new sewer tanks and a 3,000-gallon domestic water tank with a new water line to the upper road. 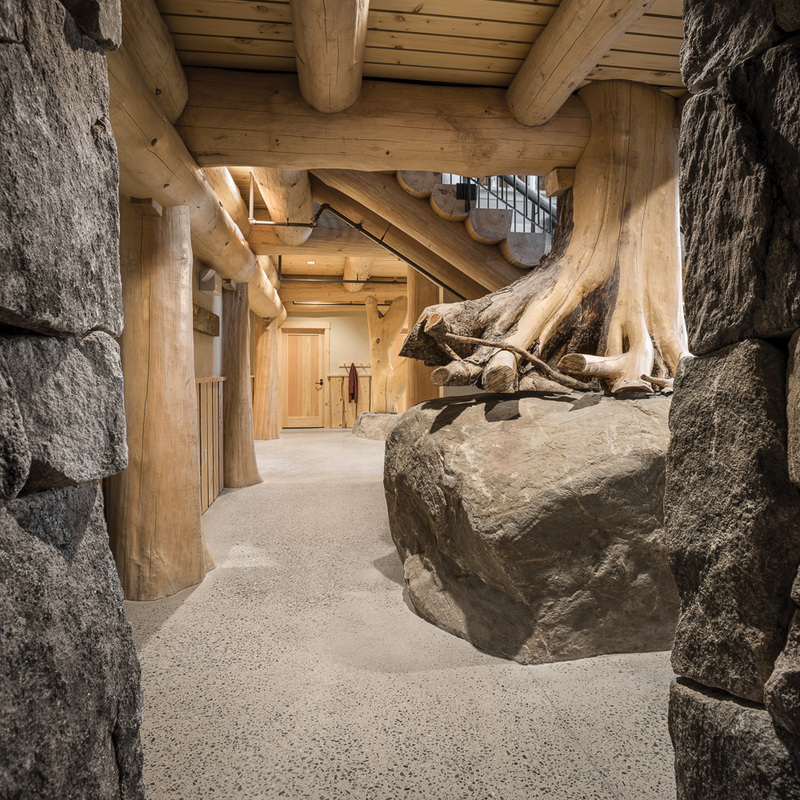 It reflected a commitment to a sacred but challenging site, which required extended siting and infrastructure costs that involved moving one building and constructing a separate smaller one, boulder retaining walls, and hardscaping and landscaping that would somehow soften all of the scarring and make the new lodge feel like an organic part of the ravine. It reflected a commitment—through its accelerated schedule—to minimizing the disruption of the student experience on Moosilauke. The question of a building’s soul was still outstanding. What did a building’s soul have to do with the people who gathered there? How much of it was formed by building materials and layout, and how much by rituals and collective memory? By shared love? By Dickey’s sense of place loyalty? The McLane Family Lodge at the Skiway doesn’t feel homey, an alum pointed out, because there aren’t students working and living there, making it their home. In her class’ 25th reunion book, former DOC president Viva Hardigg ’84 wrote: If the lodge must be rebuilt, I feel wholeheartedly that the spirit of the place is much grander than the fine old building itself. 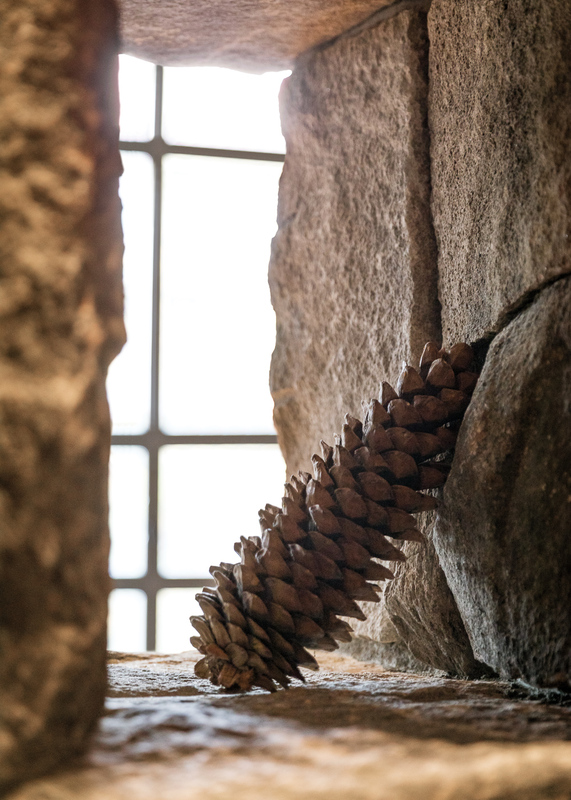 While honoring spruce logs and hand-carved joinery, our deepest commitment is to one another and the sacred strength of a common hearth, far from commerce and close to wilderness. We return to the sanctuary of the ravine because of the glory of the mountain and the distinct New England alchemy of wood smoke, oral storytelling, fiddle music, pots of tea, wool sweaters and other idiosyncratic ingredients of rustic mountain hospitality. The rituals of the culture will continue as one generation teaches the next. It will take time for the new Moosilauke Ravine Lodge to soften under the touch of hands, the feeling of feet having walked for years over the same boards. It will take time for the students to make the new building their own, to discover its quirks and charms, to create new rituals and pass them down. The mountain will anchor them. Jim Collins is working on a book that will celebrate the College’s forthcoming 250th anniversary. A crew of determined alumni takes on the excruciating hike known as the Fifty—in reverse—before they turn 50 themselves.